Well, after months of saying "We should meet up" and "Let's get together sometime", it finally happened. 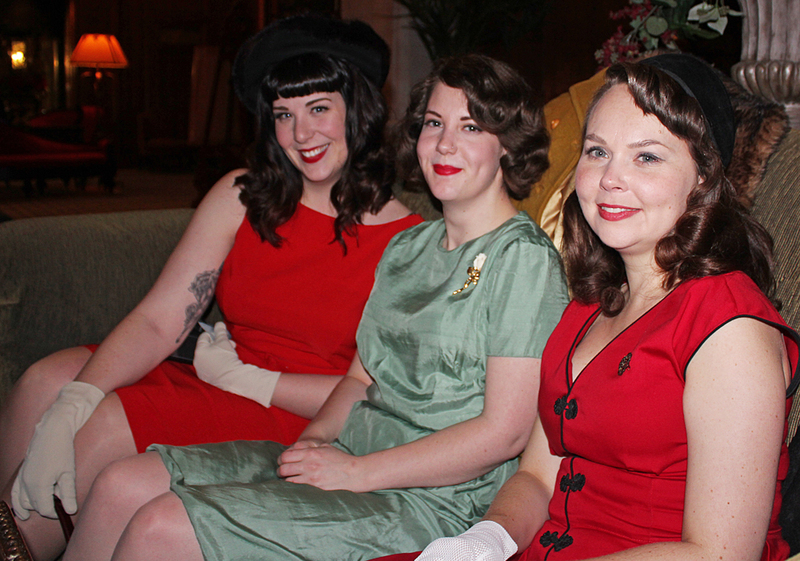 The Edmonton Chapter of the Alberta Vintage Roses (oooh, sounds so official!) met up for a few cocktails at the Fairmont Hotel McDonald on Friday night. 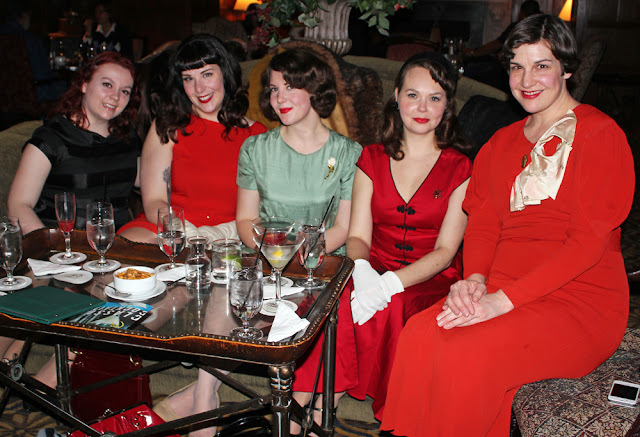 We were talking about vintage girl groups in other cities, like the Feathers and Fur get-togethers in Oregon or the parties at the Ric-Rac Club by the Vintage Mafia and envying them for their strong vintage communities (and being slightly fan-girlish). But in Alberta, there are about 10(!!) 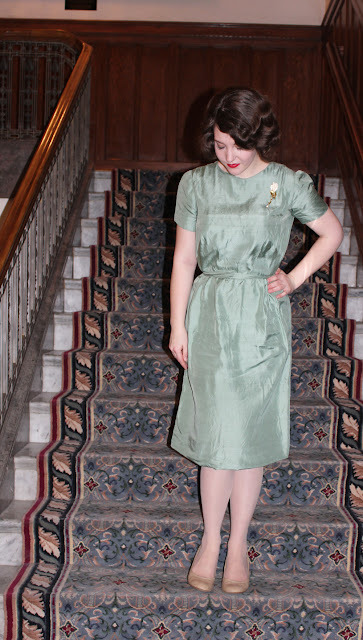 of us vintage ladies, and absolutely no reason that we can't have little get-togethers of our own. We're hoping to make our cocktail nights a monthly thing, so if you're an Alberta vintage girl who wants to come out, please drop me a line via email (laurie [at] retro-reporter.com), on Twitter or through my Facebook page. 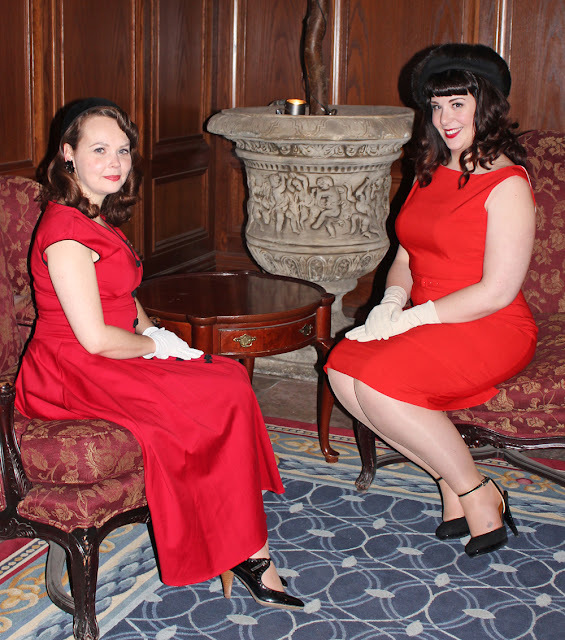 It's such a great reason to get all gussied up and have fancy drinks, especially when you're at a very posh hotel. Speaking of posh hotels, Hotel MacDonald is a beauty. Opened in 1915, it's probably one of the oldest hotels in Edmonton, and certainly the most beautiful. We couldn't resist taking some snaps in the lobby and the Confederation Lounge. Around this point my camera died and I couldn't get individual snaps of Nicole and Jill. Drat! 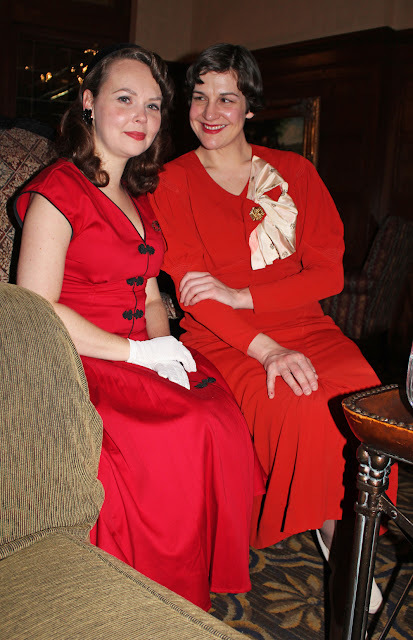 (Also, can I just mention how much I miss having a real flash for my camera? Pop-up flash just doesn't do it for me. Le sigh). Of course, you get that many vintage ladies together and there's bound to be a few questions. We were asked what the occasion was (Friday night, of course! 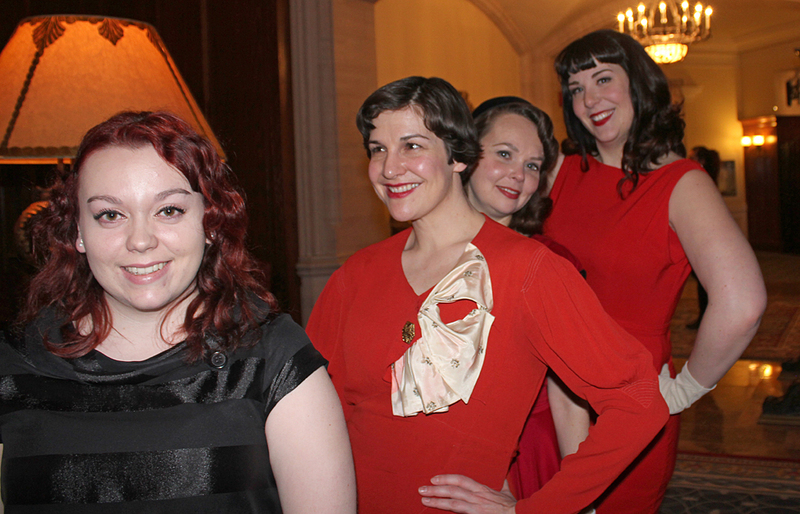 ), if we were bridesmaids (nope) and why we were all dressed up (because we like it!). People were very polite, and it was nice to not be asked if we were in a play. Also, Jill has been elected/voluntold to be PR for us, she's the best at explaining what we're all about. 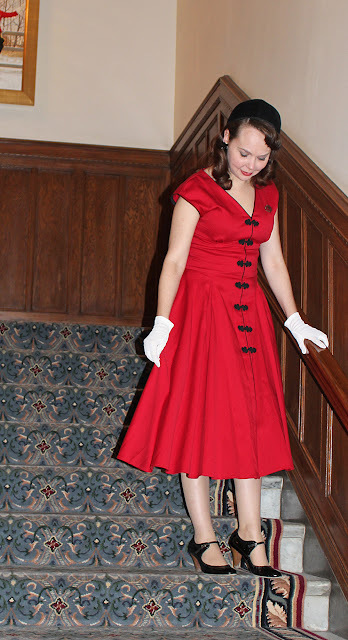 I usually just say "I'm a vintage girl" and people blink at me. Addenum: Being asked if I was a time traveller by a few drunken boys in High River is still probably the best question I've ever gotten from a stranger. In hindsight I regret not getting a photo of just the painting behind us because OMG YOU GUYS it's hilarious. It's a painting of 12 Lords of Strathcona a-leapin'. You know, like in the 12 days of Christmas. We particularly enjoyed the enthusiasm of the Lord leaping over Bee's head. Go home Lords, you're drunk. Can't wait to see more of your escapades. Just started following! My word, what incredibly lovely looking evening. 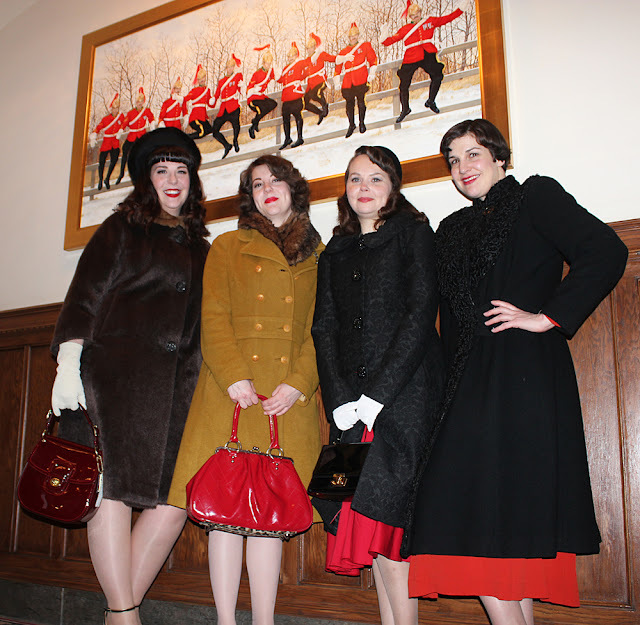 There are so few of us (what one might call "full time") vintage lasses here in Canada, especially out west, and I can't begin to tell you how much it warms my heart to know that there are small groups like this gathering together across the country (or at least in Edmonton) and celebrating their mutual love of vintage. Thank you very much for taking us along with you through these great snaps, dear Laurie. Looks like so much fun!!! Wish we had a vintage group here in Fredericton, New Brunswick (Canada). But glad I can join in thru the internet. Keep posting about your get-togethers!